A big celebration of Catalonia’s Sant Jordi organised by Ms Carme Calduch Rios (Bye-Fellow) took place in College on Friday 22 April. Catalans, like the English, have St George (known as Sant Jordi in Catalonia) as their patron saint and celebrate his day on 23 April. Legend has it that Sant Jordi slayed a dragon to save his princess and from the beast’s blood emerged a single rose. It is because of this that, for the past 100 years, men have gifted women roses on 23 April and they, in return, have given them books. Things have changed a bit since those first exchanges (men and women now both get books and roses), but the book-flower tradition remains: 5.5m flowers and 1.5m books were sold in Catalonia this year as part of Sant Jordi’s Day. 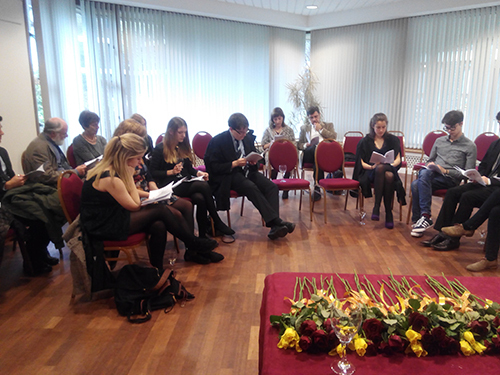 The Sant Jordi celebrations at Fitzwilliam took off with a literary event in which Catalan students and Catalan speakers living in Cambridge read out poems, extracts from novels and short stories. Following this, a book exchange took place; each of the attendants was asked to bring in one of their favourite books and these were exchanged throughout the evening. 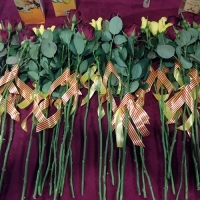 Books in Catalan were also kindly donated by the University of Alacant in Spain and these were gifted, alongside the traditional rose, to all those taking part in the celebrations. 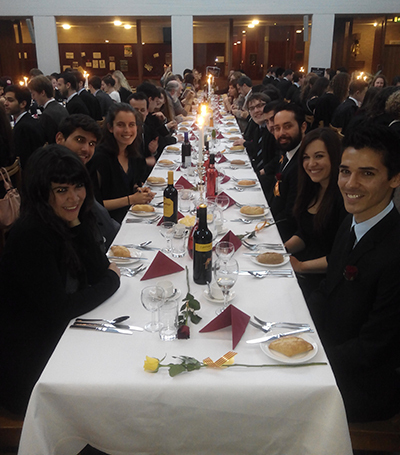 The Sant Jordi event was not only a literary and botanical affair, but also included a toast to the saint with sweet Moscatel wine from Valencia, and a big Formal Hall dinner in which Catalan speakers and students engaged in lively conversation in both English and Catalan in celebration of World Book Day and the patron saint of Catalonia and England. Dr Geoffrey Walker (Fitzwilliam College Life Fellow) and Visiting Fellows Dr Gabriel Sansano (Fitzwilliam) and Professor Rosanna Cantavella (Clare Hall) accompanied us during the celebration, making the event extra special! In 1939 Dr Josep Maria Batista i Roca (1895–1978) – historian, ethnographer and Catalan statesman – took exile in England when the Franco regime instituted a period of repression in Catalonia. In 1948 Batista i Roca, by then a Cambridge University Lecturer in Spanish, was permitted to teach a Catalan option within the MML Tripos; Fitzwilliam’s link with Catalonia began with the appointment in 1962 of Dr Geoffrey Walker as Dr Batista’s successor in the University. Dr Walker (now a Life Fellow) was Director of Studies in MML for over 20 years and was influential in bringing Dr Batista i Roca’s benefaction to Fitzwilliam. Batista felt that in Britain, and especially in a Cambridge college, any legacy he made to promote Catalan studies would be used for the purpose he wished – the stability and good functioning of his beloved Catalonia – and that it would be safe in perpetuity. Dr Walker was succeeded in 1997 by Professor Dominic Keown.